I'm one of those people who would prefer to suffer a headache until I resolve the cause rather than take a Tylenol. I've had a change in medication. As I discussed in an earlier post, I have been taking the antidepressant Sertraline (Zoloft)since 2013. I wasn't diagnosed with bipolar disorder until recently, so I was just prescribed something to help control the upswings: Seroquel. A little bit of the back story. I didn't like being diagnosed at a glance. I don't know you, Lady. I just met you today. I don't like medicines. I'm one of those people who would prefer to suffer a headache until I resolve the cause rather than take a Tylenol. So, I tend to buck against prescriptions. Three or four months ago I finally went to see a psychiatrist; I didn't like it. I've been to a psychiatrist once before, while pregnant for the second time; I didn't like it then either. The environment. The tone of the doctor. Their apparent dislike of children. Mostly, I didn't like being diagnosed at a glance. I couldn't understand how someone could draw any significant conclusion from seeing me just once -- and then give me a prescription. I don't know you, Lady. I just met you today. So, this week I ended up back at my trusty ol' PCP. I've had the same doctor for years; if he gives me a prescription, I probably need it -- or at least I'll probably take it. To my surprise, he ended up prescribing me the antipsychotic Seroquel (quetiapine), the same medication that the psychiatrist prescribed. Ok, so maybe the psychiatrist was fine, and I have a trust problem. I expected some drowsiness with the quetiapine too. I remember when I began taking Zoloft I was exhausted and dizzy all the time. I expected some drowsiness with the quetiapine too. I haven't seen any difference in dizziness since starting quetiapine, but I've spent much of the day incredibly drowsy. As soon as I sat still my eyes were closing. I noticed my speech was weird too at times -- like I was talking while asleep and literally struggling to make sense. It's evening, and close to time for another dose; the fog has lifted. Chris building a beach house. This is a homeschool blog, so I should mention what we did for school today. We had no formal lessons today. 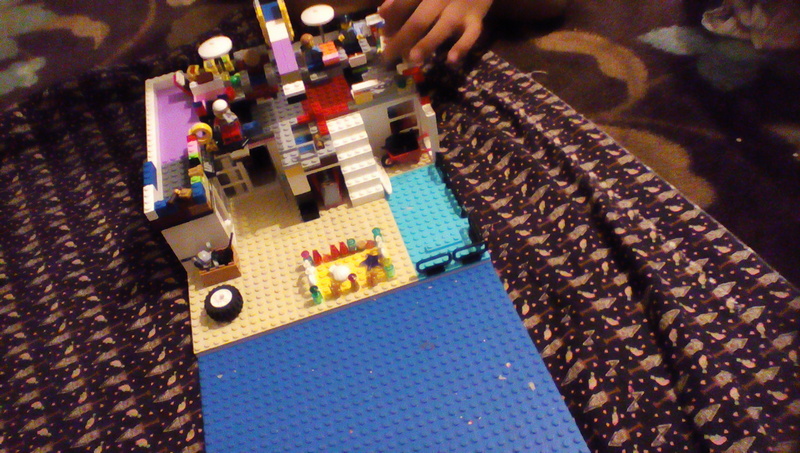 The kids divided the day between outside play and LEGO -- which is just as beneficial. It was the kind of day I would have called in sick if I worked anywhere but at home. No fights. No meltdowns. Everyone ate and had plenty of water. And they came up with some remarkable LEGO creations. I'd call that a successful day. It was the kind of day I would have called in sick if I worked anywhere but at home. So, that's Art. Gym. Health. Science. We aren't behind though. It is the law in our state that homeschooled children have to attend school for the same number of days as public schooled children each year. Though we do take odd holidays, we still meet, and usually far surpass, the attendance requirement by having school on days that traditional schools do not -- such as on Saturdays and during the Summer. We had a regular school day yesterday, for instance, which was Thanksgiving. The only time we never have school or homework is Sunday -- as a way to mark the Sabbath. Every other day is a potential school day.